When you synchronize your on-premises directory with Office 365 you have to have a verified domain in Azure Active Directory. Only the User Principal Names (UPN) that are associated with the on-premises domain are synchronized. However, any UPN that contains an non-routable domain, for example .local (like billa@contoso.local), will be synchronized to an .onmicrosoft.com domain (like billa@contoso.onmicrosoft.com). If you currently use a .local domain for your user accounts in Active Directory it's recommended that you change them to use a verified domain (like billa@contoso.com) in order to properly sync with your Office 365 domain. Azure AD Connect synchronizes your users' UPN and password so that users can sign in with the same credentials they use on-premises. However, Azure AD Connect only synchronizes users to domains that are verified by Office 365. This means that the domain also is verified by Azure Active Directory because Office 365 identities are managed by Azure Active Directory. In other words, the domain has to be a valid Internet domain (for example, .com, .org, .net, .us, etc.). If your internal Active Directory only uses a non-routable domain (for example, .local), this can't possibly match the verified domain you have on Office 365. You can fix this issue by either changing your primary domain in your on premises Active Directory, or by adding one or more UPN suffixes. 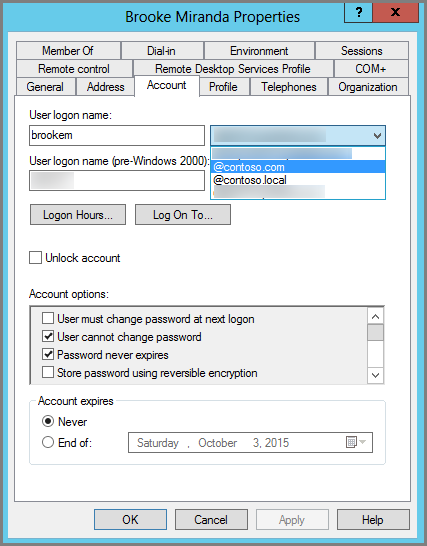 Change your primary domain to a domain you have verified in Office 365, for example, contoso.com. Every user that has the domain contoso.local is then updated to contoso.com. For instructions, see How Domain Rename Works. This is a very involved process, however, and an easier solution is to Add UPN suffixes and update your users to them, as shown in the following section. After you have updated the UPNs to use the verified domain,you are ready to synchronize your on-premises Active Directory with Office 365. On the server that Active Directory Domain Services (AD DS) runs on, in the Server Manager choose Tools > Active Directory Domains and Trusts. Choose OK when you're done adding suffixes. 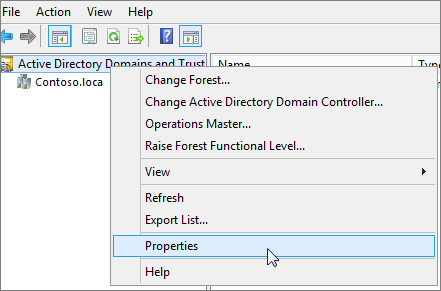 On the server that Active Directory Domain Services (AD DS) runs on, in the Server Manager choose Tools > Active Directory Active Directory Users and Computers. 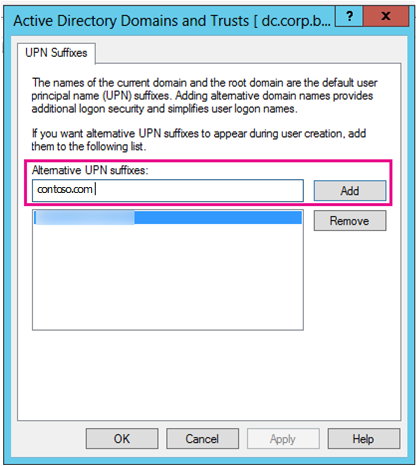 Alternately you can bulk update the UPN suffixes You can also use Windows PowerShell to change the UPN suffix for all users.